This Theme needs the latest Gallery Version, currently 2.2-SVN with Core 1.1.16 Theme API 2.4 and Core API 7.0 are required to install this theme and to benefit of the Gallery 2.2 features like Virtual Albums!. 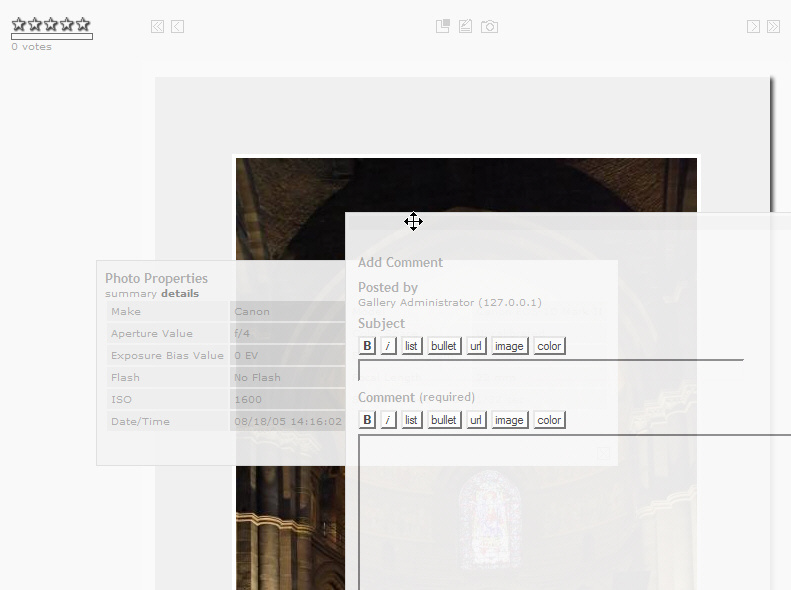 Using the Lightbox 2.0.2 script, see Gallery2:How_to_implement_Lightbox_on_Gallery_2, it offers some new useability. Unfortunately, Pedro is sometimes a bit slow catching up (having a lot of other responsibilities I assume), so I had to adjust the PGtheme more than once to get it up to date - and added some gimmicks like the flying Exif- and Comment-Boxes. Finally with 2.2-SVN, I've added support for the Virtual Albums and added - thanks to a discussion in the forums - a Lightbox. and allows to use a Lightbox-Display to link to the Photo-Page, and a final Lightbox to popup on the Photo Page (using always the third resize - I couldn't find something more clever, yet). In addition, I took Pedros latest gimmick, the Popup-Navigation Images into the Photo Display. And - its (seems to) be fully compatible with the Keyalbums introduced with Gallery 2.2. There seems to be an issue with the non-standard themes and selecting options, i.e. for the Imageblocks. My workaround is to use a Standard Theme like Matrix as Default, switch the Root-Album to PGlightbox and inherit this theme to all albums below the root. This ensures the Siteadmin to run perfectly - as its still using a Standard-Theme. Allows the use of the PGtheme Slideshow, which still fits perfectly as its coming directly from the mother of this theme - and allows to displays the little Slideshow Icon where applicable. Nothing specific - only the options to display the little avatars for XHTML-Validation, Gallery, Donate and the Copyright messages to be used in your gallery. The settings below will add a nice little canvas and a copyright notice of the Image author to the picture displayed. The color is optimized for my favorite PGsnow Colorpack. The Size of the Lightbox Preview on the Album Pages has to be defined in theme.inc directly. 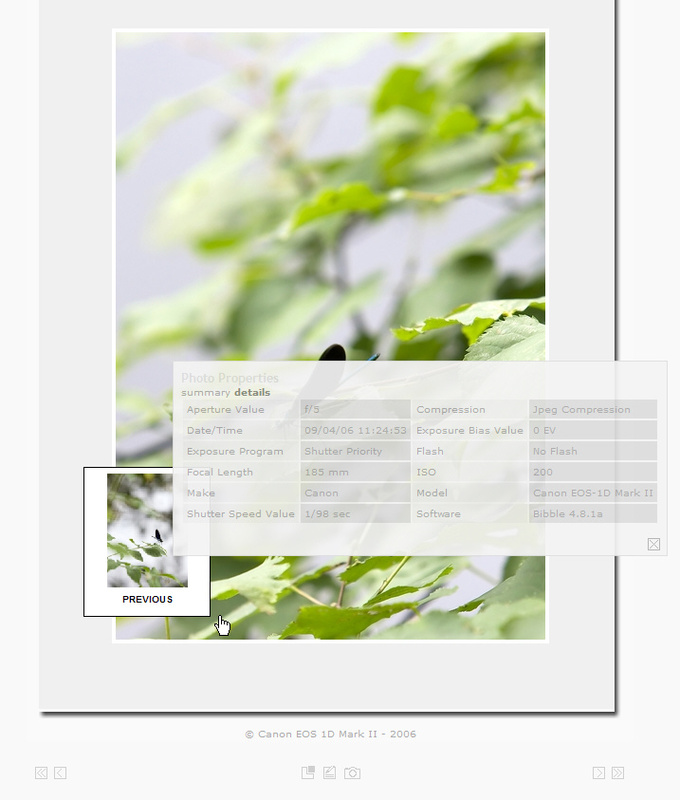 The Default of 800px forces Gallery to look for the nearest possible resize to be displayed. 800px is a good compromise for 17" screens, if you have bigger sized screens, you might think about increasing this to 960px or even 1024px. 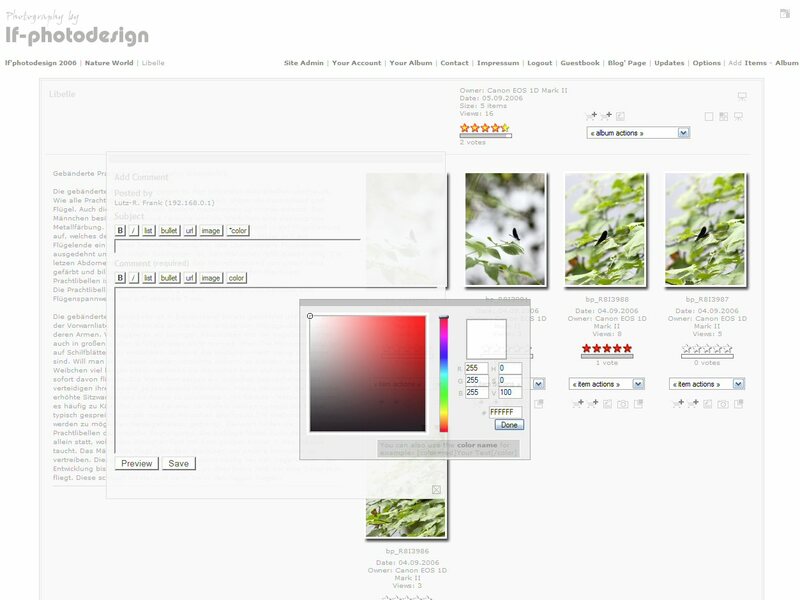 The PGlightbox theme is highly optimuzed for the PGsnow colorpack. In case you like to apply another colorpack, you will need to adjust a few things. There are specific Icons, i.e. for the eCard functionality in PGsnow\images\set1 and -set1\3d_on you will need to copy to the new colorpack location (ecard.gif & ecardon.gif). 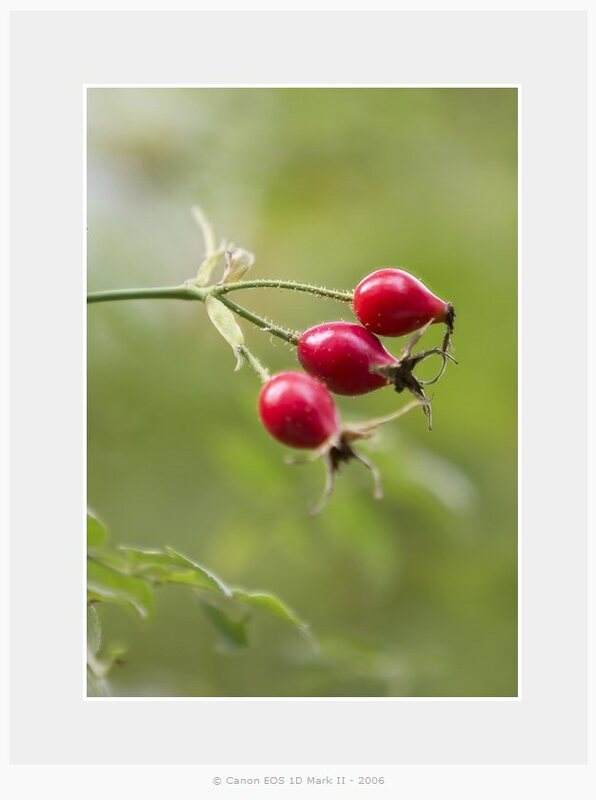 "Blocks to show on photo pages" - 'Add Comment'. The attached ZIP contains all files neccessary, but be aware, its a first trial for Gallery 2.2 - you might encounter issues, which can be discussed here or better directly at the forums. Update: 07.09.2006 - implemented a 'Send eCard Icon' on the Photo Page and fixed the display of both useable carts in the Top Navigation. "Add Item to Cart" versus "Purchase Item". Added an archive containing the standard modules like the PGcolorpacks, PGimageframes and PGslideshow. Update: 01.10.2006 - 1.1.3 Implemented flying Comment Boxes and fixed some minor permission issues (Lightbox Popup not visible for Guests on Photo Page). Flying Comments on Album Items works, but only the first one will have the formatting icons active. Found no fix yet. Update: 06.10.2006 - 1.1.4 Proper stacking of popus and dialogs and indicate 'flying dialogs' by mouse cursor change on mouse-over event. Frames and Passpartouts on the Photo Page can have Shadow-Image Frames again. Update: 19.11.2006 - 1.2.0 Fixed several forgotten local file references (Thanks to the testers ;)) and switched to Lightbox 2.0.2+, which includes a nice fit to screen and zoom feature. The current distribution will always be found on the Gallery2:User_Contributions Page or directly here. The modules like Slideshow, Imageframe and Colorpacks are still usable with PGlightbox, I've added them for your convenience here. The biggest "Thank You" goes to Pedro for making this theme come true by designing the mother of this theme, PGtheme! I hope you don't mind using your skeleton ... 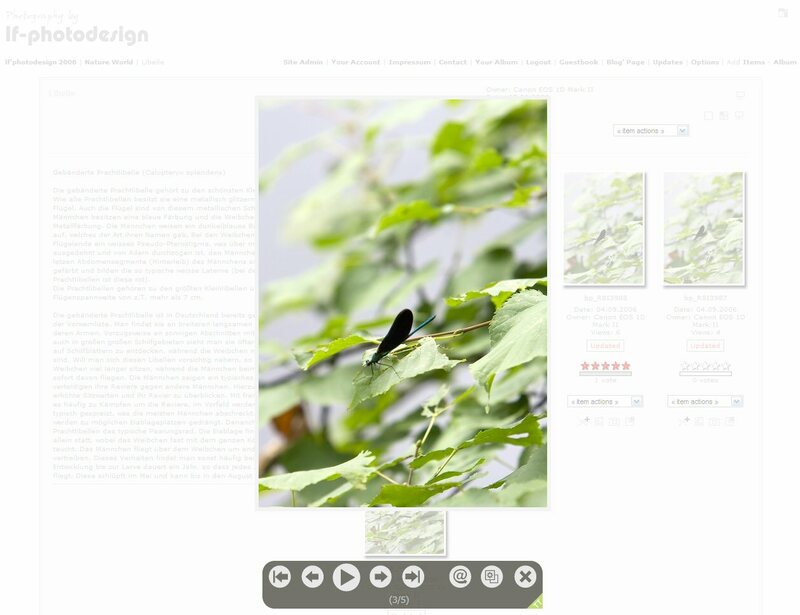 If you like this theme, please leave an entry on my Guestbook or comment my work at lf-photodesign.de. Any feedback will be highly appreciated. And - do you think the Guestbook could make a Gallery module? This page was last modified on 1 July 2013, at 15:02.